this pcb uses a combination of through-hole and SMT parts-- euro DIY builders are taking on more and more SMT builds, why should frac be any different? any demos of it? How does it sound? I don't have any on hand of JUST these. I'll have a couple built soon as part of another project though, and would be happy to post some. However, all of the Black 5U and Signal Block demos in my Sound Cloud (drj3rk) are using a previous-version variant of these. The audio signal path is similar to a 292. The CV circuit is completely different. I prefer the sound of these. I believe it's mostly due to the CV section and the use of VTL5C1s. These will respond well into the audio range for FM but still have a nice ring to them at low-mid settings. You can really adjust the low range to make them sound like slow or fast vactrols due to the extra dynamic range of the 5C1s. Hope that helps a little. As soon as I get these populated on my "Blue Synth" board I could make a few demos. Is the previous variant same as the 4U dual version? No, the dual 4U version is a one pole with no resonance. These are two pole like the 292, plus resonance. They sound quite a bit different. I'll see if I have any audio that would demonstrate it somewhat well. So my Black5U playlist has a couple good examples of one prior revision of this LPG. The new one here is just improved in a few ways and a little more flexible. Black 5U - 005 is probably the best example followed by 003. Not much resonance or audio rate modulation though. I will have to make more for those. And some raw ones too. I bought one of these and was going to make a start on it today. I can't find a BOM or any documentation anywhere? (edit) I see they're there in the OP but you can't actually see them unless you're logged in. Might be worth putting them somewhere on the synthcube site, as I don't log in here very much, and there's no indication of there being a link here to non logged in posters. we're a bit behind in getting some documents up on the webstore, but we will do so. I appreciate your continued support for this great and underrated format. Hi guys, just finished my build, purchased just the pcb by itself and am wondering about some of my component choices as I'm not sure if I've used the right stuff. For the vactrols I've used vtl5c3's instead of vtl5c1's. When pinged with a gate the output tends to ring for a very long time and never really shuts off no matter where the CV attenuation pot is set. Would the vtl5c1 make a difference in this department? I.e. would the input be completely muted with no CV and the ringing die out eventually? Also the resonance pot is behaving strangely, at about halfway the output seems to go into massive amounts of feedback to the point where the input is not longer discernable, only a heavily distorted thud. I'm wondering if it's because I've used a regular ceramic disc type cap instead of the mlcc specified on the BOM in the resonance feedback loop (22pf). Would using the called for mlcc make a difference here? I think I've also used a film type capacitor for one of them too. As an aside I've also built the original stroh non-resonant dual LPG with the vtl5c3 and noticed that the ringing also doesn't tend to stop and the input is never quite muted. I'm not sure about the differences between the vactrol types so wondering if it's worth tracking down the vtl5c1's to try them, and whether I can expect a different behaviour from the circuits if using them. Sorry for the long post, any replies are greatly appreciated. These are the only optogate lpgs I've built or used so not quite sure what to expect from them aside from being able to ping with a gate. I haven't tested 5C3s in this new version of the circuit. However, there are a few things that will impact the response. First thing is that the 5C1 has wider dynamic range than the 5C3 (around an octave more). It also has a faster response time in general. The CV section of my version of the LPG is a simple emitter follower configuration. The values were chosen to keep the response mostly within the linear range of the transistor. I'd have to dig up the exact target current values. I keep the range going through the vactrol LED between 0 and around 6mA. This is a lot lower than the full range of most VTLs, but it's the specs of the 5C1 that complement this well. We'd need to figure out a good balance of the 5C3's range, response time, and the emitter follower values to make it work more like a 5C1. IMO it's worth it to track down the 5C1s. I know that they'll be carried by a few of the DIY shops at some point, CabinTech has them, and maybe a few other places at this point. I have a little original stock left, so I haven't looked for a little bit. The XVive 5C1s should be fine too. As far as the resonance goes, that's kind of the way it typically works on these. My resonance circuit is nearly identical to the versions of the 292C that have resonance (like the TW292 etc.) You can try swapping out the op amp for a different type, you could try a film cap, but it's still going to be fairly harsh at higher settings, it won't have the smooth range of control that most filters would have for resonance. Some of the variation is due to the vactrols, but in my experience they don't vary as widely (at least within the Excelitas era) I've often heard from others. (maybe that's also down to the 5C1s vs 5C3s... Not sure.) I've also had different CA3140 op amps behave differently in the resonance loop funny enough, so maybe try something like an LF351, TL071, etc. Film caps IMO do make an audible difference in filters, and possibly in the resonance loop here (though I haven't tried one there.) It's worth a try, though I don't believe it has a huge impact on the sound being as small a value as it already is. You could try increasing it a bit too. Maybe 47pF. MLCCs are ceramic, so that won't give you much of a change either. My suggestion would be to grab 5C1s if you can. Next item, (if you socketed, or can desolder the resonance op amp cleanly, try another type there. You could try a log pot instead of linear there to get the range to smooth out a bit too. I'd start with these. I will also try to grab those resistor/current values for the CV circuit as well, and post them here. I've got them somewhere. 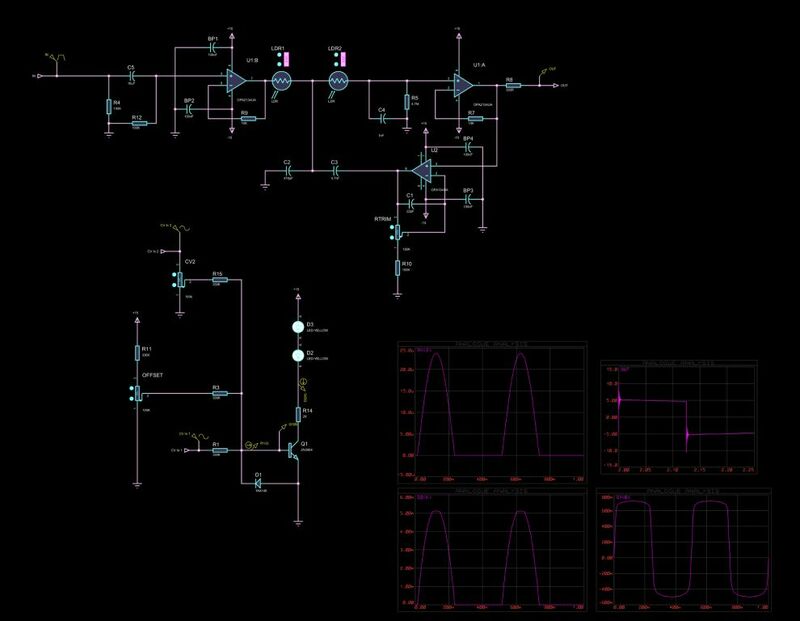 These circuits do vary a bit from one build to the next, but we should be able to get this to behave the way you want it to. Nice! I hadn't checked, but figured you'd carry them. 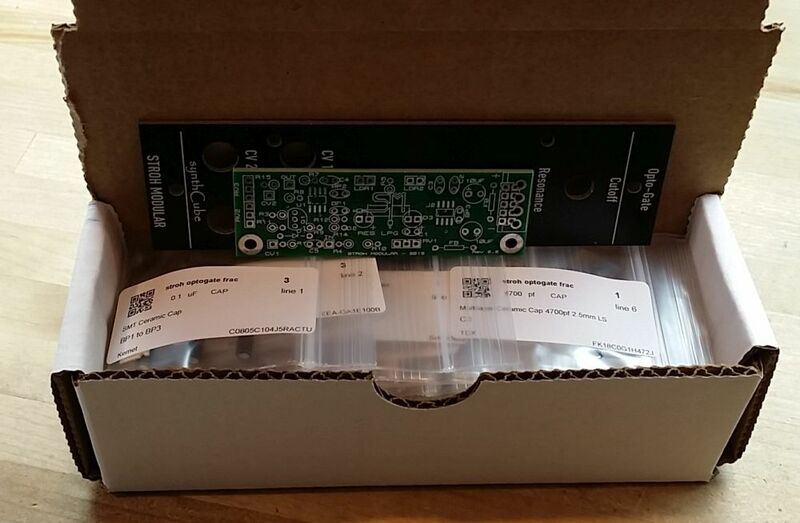 Thanks very much for your detailed response Dustin and for making such great pcbs available. My 5u system is currently running with your DIY power supply and I've also got one of your Pico VCO's whirring away in there too, both excellent projects. I've tracked down and ordered some 5c1's (xcite version) from a German supplier so when they arrive I'll chuck them in the circuit (with sockets) and report back as to any changes in its behavior. After I've done that I'll possibly swap out the resonance pot for the log response or experiment with the op-amp type as suggested and see how that goes. Won't start experimenting until I change those vactrols though. By the way I wasn't able to find the VTL5c1's on the Synthcube site, searching only comes up with the link to the Stroh LPG kit. They also don't appear in the Vactrol section. I am just building up this PCB onto a 4HP diy Euro panel. I wanted to stick to the same 9mm pots but i didn't have any 1K. I just wanted to ask if you think 10k will be ok for RV3 or is this going to mess things up ? I've been building from the 'frac lowpassgate. pdf' as that was all that was available as far as i could see (before the above ^^^ schematic). I recently bought your Strohmodular SKETCHPAD and i really love the way you made it and the way it sounds. I'm actually full eurorack and i never found a couple LPG/envelope sounding like yours. NLC LPG is approaching and i like it, but it had too much resonance for me and yours just sounds better to my ears. 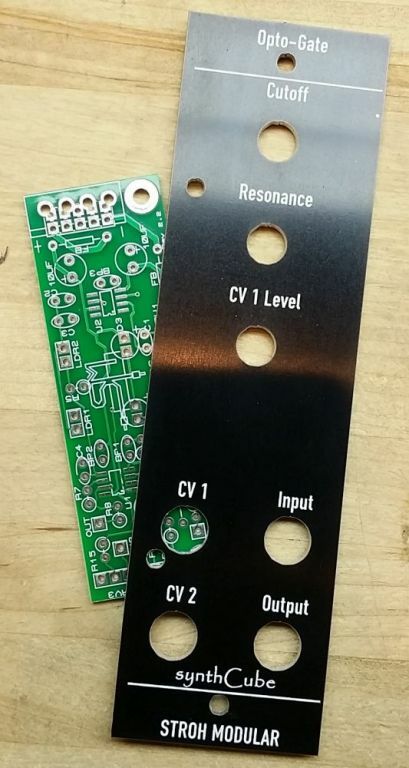 I'd really like to DIY a eurorack version of this exact couple in one eurorack module, are you ok with that ? Any chance you could send me schematics and BOM of these ? I looked your LPG's still available at synthcube and found Opto-Gate, but it's a FRAC so -15/+15v if i'm correct and i'm not sur it sounds the same. Are any of these available today in eurorack ? What about your triangle VCO ? txs J3rk.